There’s one sweet treat that always seems to be calling my name – and that’s cookies. 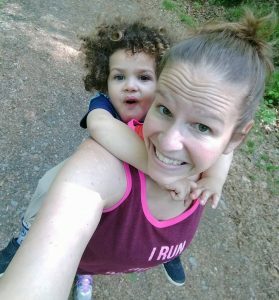 When I had to be dairy free back when I was nursing my son (he had MSPI), I tested quite a few dairy free cookie recipes. 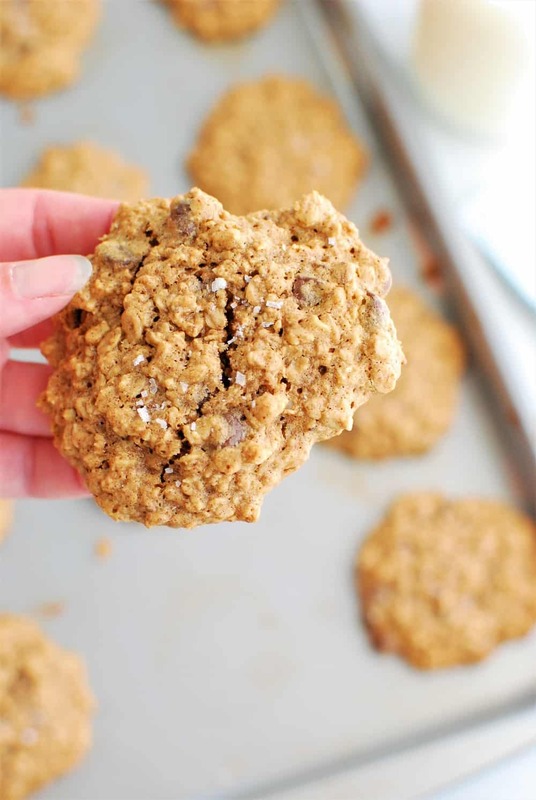 These almond butter oatmeal cookies were by far one of my favorites. The cookies are nutty and chocolatey, yet are still relatively healthy. Would you believe there’s only a third a cup of maple syrup that sweetens this whole batch?! 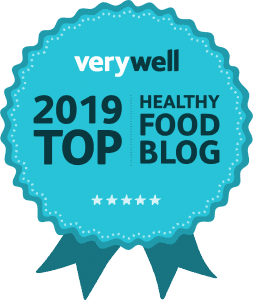 It’s awesome to find healthier alternatives to traditional favorites. One thing I love about these cookies is that they are really quite simple to make, and only use a few ingredients – most of which you probably already have in your pantry. 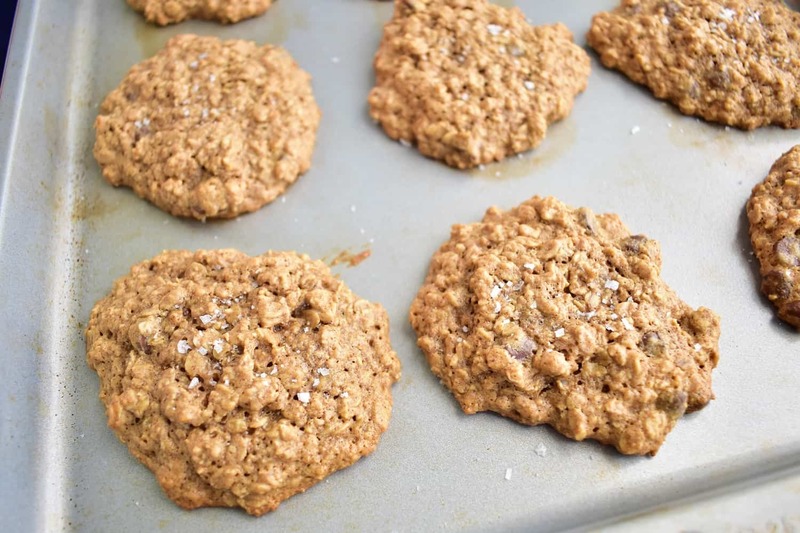 Aside from pulsing some of the oats in a food processor (or blender) to create a coarse flour, the rest of the recipe is basically just mixing everything together and tossing it on a cookie sheet! But don’t worry, the cookies won’t spread all over the place or anything. The cookies will be very soft, but that’s part of what I like about this recipe! As an optional bonus, you can also sprinkle the cookies with coarse sea salt right when they come out of the oven. It adds a whole additional level of flavor! Of the top 8 allergens, these *do* contain tree nuts (almond butter) and eggs. 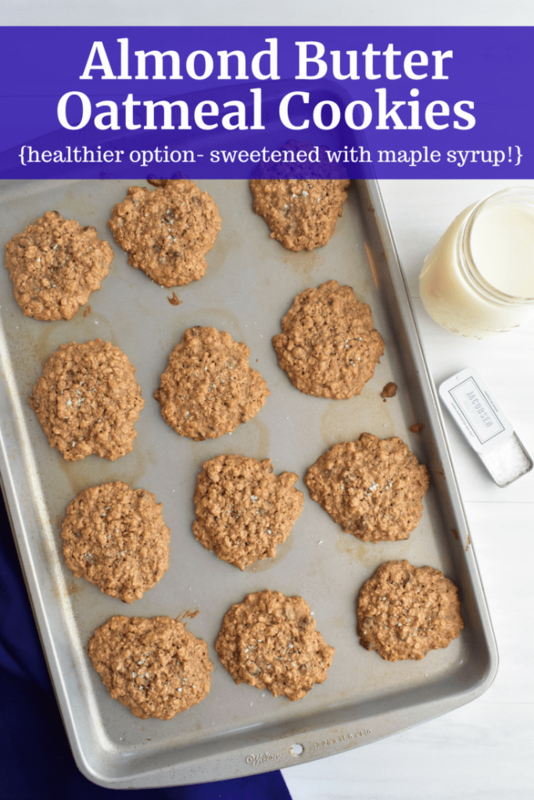 I hope you get a chance to try these almond butter oatmeal cookies ASAP – and if you do, be sure to pop back over here and let me know what you think! And if you’re looking for more cookies, you can check out this list of twenty dairy free cookie recipes. 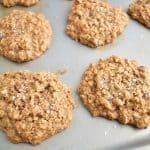 These scrumptious almond butter oatmeal cookies are nutty and chocolatey, and are sweetened naturally with maple syrup! 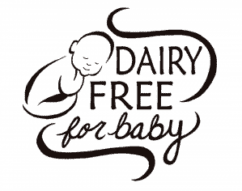 Dairy free and gluten free. Combine the almond butter, coconut oil, maple syrup, egg, and vanilla together in a large bowl. Whisk until well combined. Take half a cup of oats and add to a blender or food processor. Pulse a few times to create a coarse oat flour. 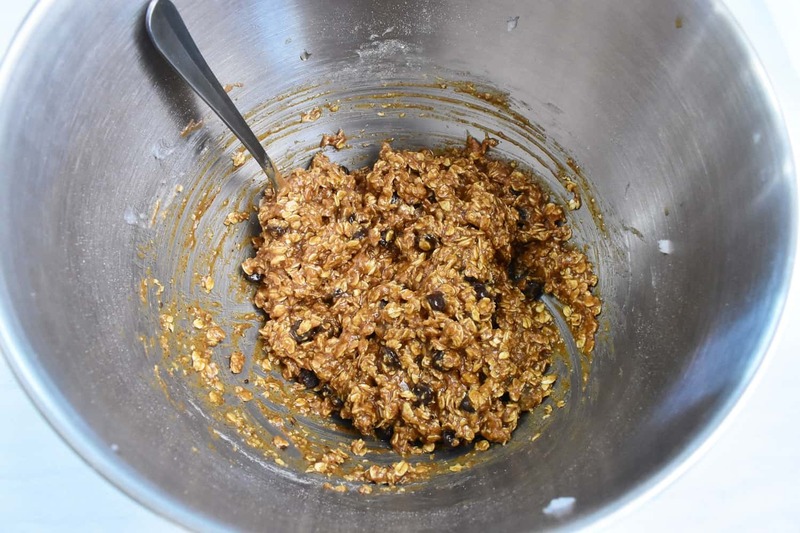 Add the oat flour, rolled oats, salt, and baking soda to the bowl. Stir until everything is just combined. Fold in chocolate chips. Spoon cookie dough onto a baking sheet (you should have enough batter for about 12 cookies). Bake at 350 degrees for 10 minutes, or until cookies are a light golden brown color. If desired, sprinkle with a little coarse sea salt when you remove them from the oven. Let the cookies cool on the baking sheet for at least 5-10 minutes before removing. -If gluten free, be sure to use certified gluten free oats. -As these cookies use maple syrup rather than regular sugar, the consistency of the cookie is quite soft. If you are looking for a crispier cookie recipe, this is not an ideal choice. -Do not cook these on a silicone baking mat – I have found that they do not cook correctly. Use a regular metal baking sheet for best results. Share with me: What’s your favorite kind of cookie? 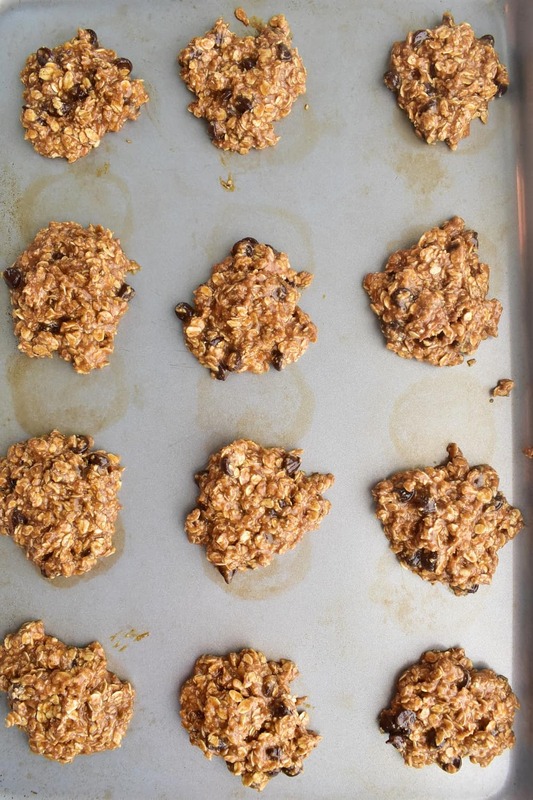 Have you made any dairy free cookie recipes? 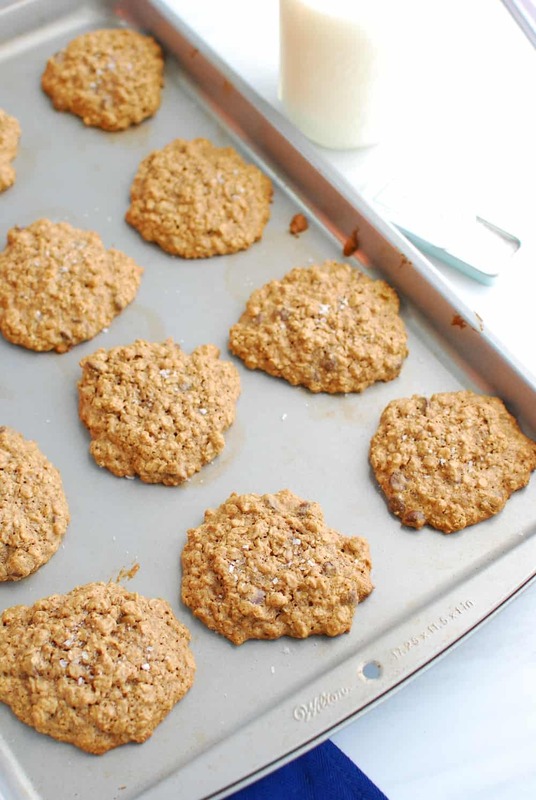 Do you think you’d love these almond butter oatmeal cookies? These look wonderful and I love that you sweetened them with maple syrup. I do that quite often because I am paleo-ish. Thanks Kimmy! I try to use some of the natural sweeteners when possible, though sometimes it can be tough with baked goods depending on the total moisture content of the recipe. Luckily it works well in these cookies!